Asics Corp. reported its sales in the Americas slumped 17.3 percent in the first half, ended June 30, to ¥59.3 billion ($578.8 million). The drop was blamed on “the effect of changes in the retail market and intensifying competition in the U.S., in addition to the effect of foreign exchange rates,” according to the Japanese sports giant’s corporate statement. On a currency-neutral basis, sales were down 11.8 percent. The region’s income tumbled 84.4 percent in the period to ¥717 million ($7 million), mainly due to the impact of lower gross profit margin reflecting the weaker Brazilian real and a recording of allowance for doubtful receivables, presumably largely tied to the Sports Authority bankruptcy. The profit decline came despite efforts to reduce advertising expenses and other expenses. On a currency-neutral basis, Americas income was down 83.4 percent. Extrapolating first-quarter from first-half results, Asics Americas sales came in at ¥27.7 million ($270.4 million) in the three-month second quarter against ¥37.4 million a year ago, a drop of 25.9 percent. The region showed an operating loss of ¥350 million ($3.4 million) in the period against earnings of ¥1.64 billion in the same period a year earlier. In a separate statement, Asics America said despite the challenges, the brand continues to make progress under a growth plan led by Gene McCarthy, who took over as the region’s president and CEO last October. 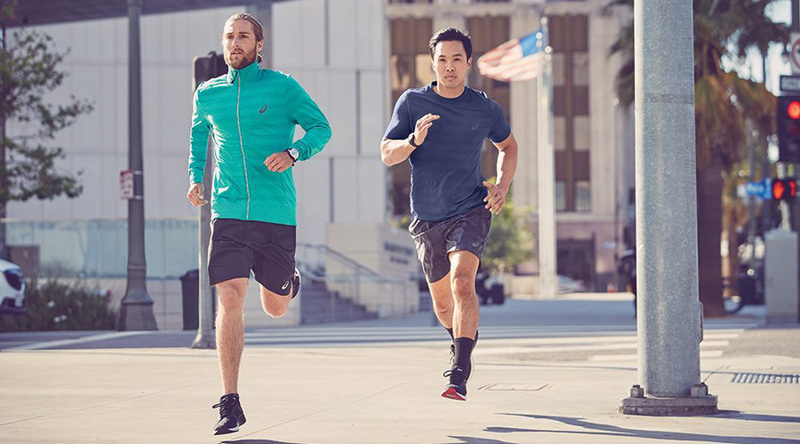 A bright spot for the quarter in the Americas was the Asics lifestyle division, which again saw growth led by the Asics Tiger brand. This growth was fueled by sales of Asics Gel-Lyte III, Gel-Kayano Trainer and a new model of the 2016 Gel-Classic. Asics Americas also noted that it saw a good response from its recently-launched models: Gel-Quantum 180, Gel-Quantum 360 and FuzeX. DynaFlyte, its lightest-ever cushioning shoe launched in June, earned “Best Debut” in the August issue of Competitor Magazine. Other quarterly accomplishments in the region included the signing of sprinter and long jumper Jarrion Lawson and the appointment of Andrew Richard, most recently at Puma, as VP of sales. Company-wide, Asics Corp.’s global sales in the first half slid 5 percent to ¥210.7 billion ($2.06 billion). Operating income declined 8.8 percent to ¥19.4 billion, while net income was down 18.4 percent to ¥11.8 billion ($115.2 million). Other regions also saw revenue declines, although they were more modest than in the Americas region. Sales in the company’s home market of Japan decreased 3.4 percent in the half to ¥65.8 billion ($642.3 million), while the region’s income increased 68.5 percent to ¥5.2 billion ($50.8 million). Asics said that as part of structural reforms to its domestic business, Asics promoted minimizing and withdrawing from lower profitable products and took steps to build a lean organization structure. European sales decreased 1.8 percent in the half to ¥55.8 billion ($544.7 million), due to the effect of foreign exchange rates, despite steady sales of running shoes. On a currency-neutral basis, sales increased 6.3 percent. In contrast, the region’s income increased 12.7 percent and grew 21.9 percent on a currency-neutral basis to ¥5.99 billion ($58.5 million), mainly due to an improved gross profit margin. Oceania/SouthEast and South Asia area sales increased 12.5 percent in the half to ¥12.5 billion ($122 million), due to the continuing strong sales of running shoes. On a currency-neutral basis, revenues in the region jumped 26.7 percent. The region’s income increased 16.6 percent to ¥2.23 billion ($21.8 million) due to the effect of increased sales, and expanded 31.6 percent on a currency-neutral basis. East Asia area sales increased 9.8 percent in the half to ¥22.7 billion ($221.6 million) and increased 24.1 percent on a currency-neutral basis, due to the continuing strong sales of running shoes, Onitsuka Tiger shoes and others, particularly at the subsidiary in China. The region’s income increased 44.9 percent and jumped 63.2 percent on a currency-neutral basis, to ¥4.01 billion ($39.1 million). In its other business segment, sales decreased 18.5 percent in the half to ¥4.1 billion ($40 million), due to some weaker performances such as outdoor wear under the Haglöfs brand and the effect of foreign exchange rates, despite strong sales of Haglöfs outdoor shoes. On a currency-neutral basis, sales decreased 12.6 percent. The segment loss was ¥517 million ($5.1 million). Asics kept its forecast the same for the year. It expects sales to decline 6 percent to ¥403 billion and operating income to drop 16.2 percent to ¥23 million.